The name for Green Bridges’ newsletter ‘Dancing with the System’, was chosen quite intuitively. 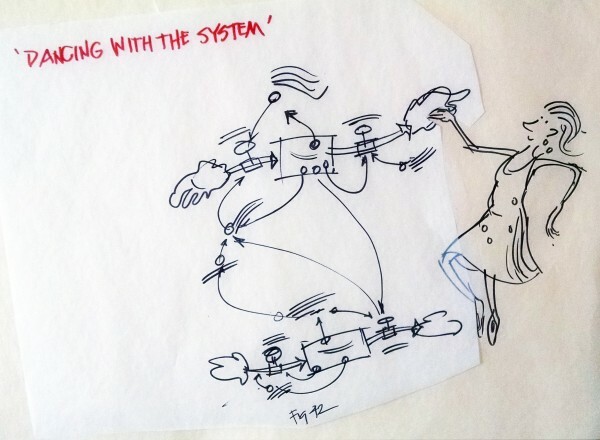 You might believe how surprised I was when I found out that Donella Meadows, one of the persons that influenced me most when it comes to understanding the power of systems thinking, wrote a blog called ‘dancing with systems’ a few decades ago. A blog in which she explains what the limits are of systems thinking. And how important it is that we learn to dance with systems. Donella Meadows: “We thought that [through systems thinking] we could control systems. That we could make systems do what we wanted them to do. But we found out: we can’t control systems or figure them out. But we can dance with them! With permission of the Academy for Systems Change (formerly the Donella Meadows Institute) we hereby reprint Donella’s blogpost on dancing with systems. Hope you enjoy it just as much as we do. We couldn’t have explained the importance of ‘dancing with the system (rather than trying to control it)’ any better. The systemic promise of populism: you’re no longer alone – I’m with you! And not with them!